The holidays are done and its Back To School season for our little ones. Everyone is busy and getting back to the school routine. In the midst of all this, how about giving your child a perfect gift for their next adventure and dream filled imagination? 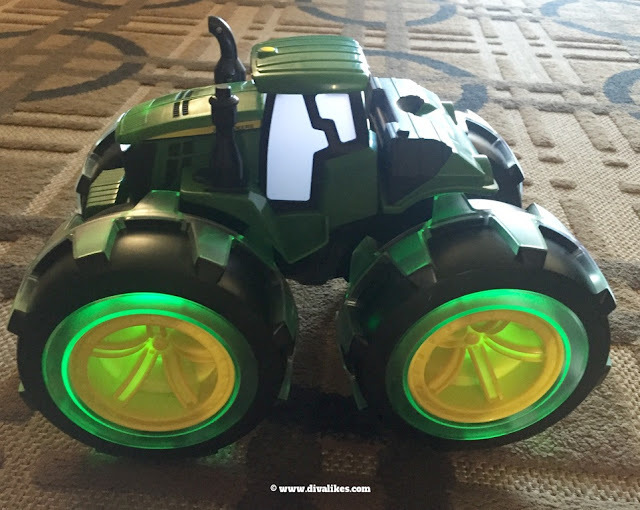 Officially licensed by John Deere, Monster Treads Lightning Wheels Tractor has a super cool monster vehicle styling and light up wheels that will surely spark an imaginative play for your kids. Let's see the features of this wonderful product from TOMY and what makes it the best addition to your child's play. Priced at $24.99, this nine-inch scale Monster Treads Vehicle is perfect for kids ages 3 years and older. 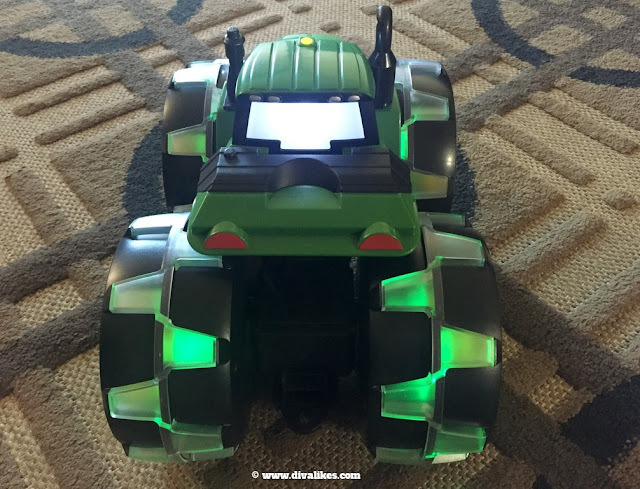 All you got to do is roll the tractor to activate the super cool light up wheels and see the green LED lights come to life. Awesome, isn't it? When the light up wheels get activated by motion, the sounds and colored lights will surely attract your child's attention and wake up their enthusiasm. The vehicle comes with 3 AAA batteries and is suitable for both indoor and outdoor play thus making it easy for your little ones to play either way. 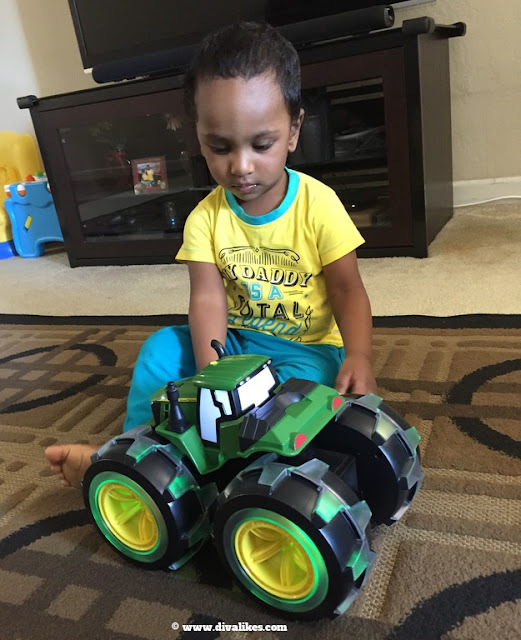 With four light up oversized green wheels and durable plastic construction, this monster tractor is ready to topple anything that lies in its path. 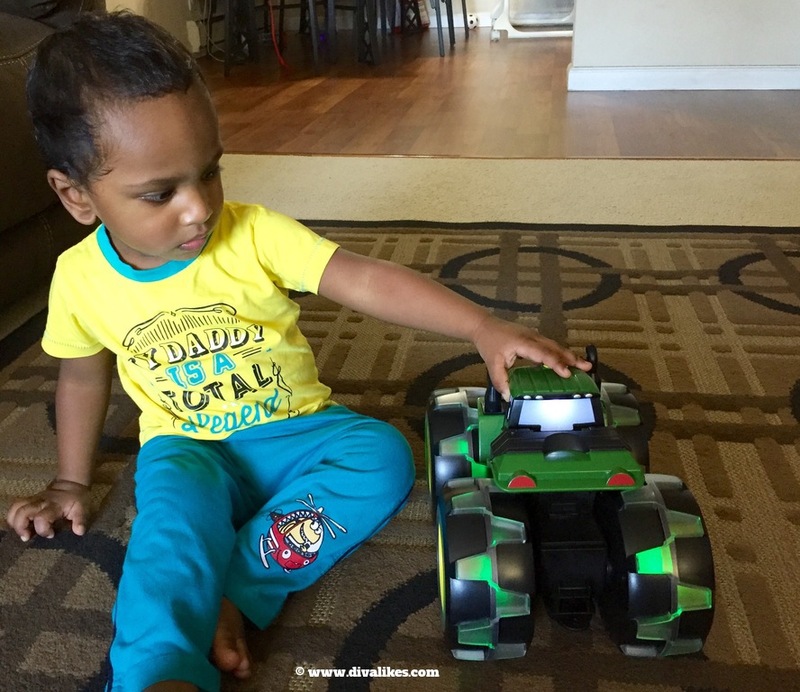 So kids can get ready to tackle any obstacle in their off-road vehicle play. 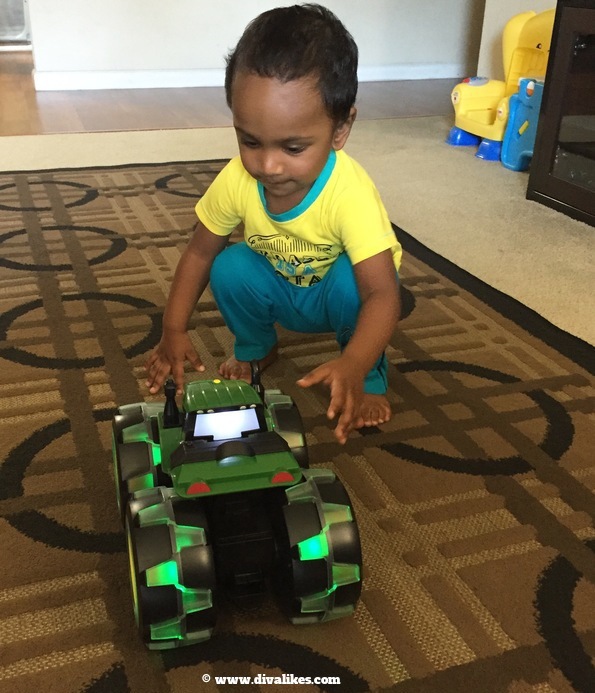 Though Aakarsh is still young to play with this toy, he enjoys watching the light up wheels and hearing the sounds which come from the vehicle. Under my supervision, he rolls the vehicle forward and backward to activate the light up wheels all by himself. I love the glowing bright LED lights of John Deere Monster Treads Lightning Wheels Tractor as it totally lights up the play room. It makes Aakarsh very happy and that gives me so much joy seeing him enjoy his play time. John Deere Monster Treads Lightning Wheels Tractor is filled with more souped-up action and features than ever before like motion-activated sounds, wheels changing color as tractor rolls and on-trend monster vehicle styling. All these features make it an ideal choice for the imaginative minds of the little ones. So do not miss out on TOMY's John Deere Monster Treads Lightning Wheels Tractor. Stir up the imagination right now! Disclosure: I received the product from TOMY at no cost to facilitate this post. All opinions are my own.